In creating this arrangement of Ravel’s 1914 song for voice and piano (the first of two “mélodies hébraïques” set that year by the composer), I relied on both Ravel’s original as well as his 1919 arrangement of the song for voice and orchestra. 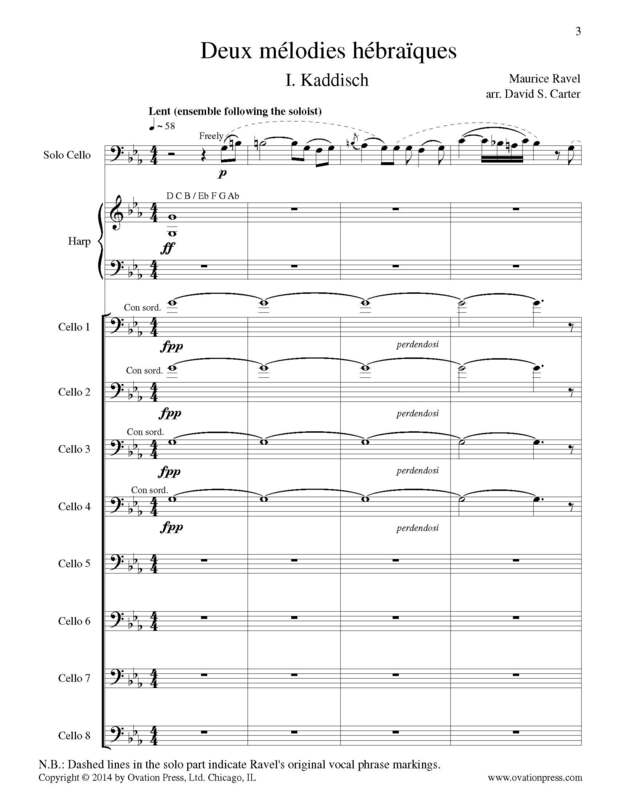 The solo cello in my arrangement takes on the role of the vocal part. The harp and eight-cello ensemble is versatile enough to take on the accompanying role played by the piano in the original and by the orchestra in Ravel’s arrangement. The original song reaches a dramatic high point near the end with a wordless ascent by the vocalist that is supported by a crescendo in the piano. Ovation Press also offers Ravel's Kaddisch for Nine Celli Arranged by David Carter.